I’m a big chicken. You won’t catch me jumping out of a plane, hang gliding or even whitewater rafting. These things are all dangerous enough as they are, but some people like to up the crazy factor. Like this guy. Navigating currents like this is dangerous even if you have the best gear and all of the proper safety equipment. How do you make it even more deadly? 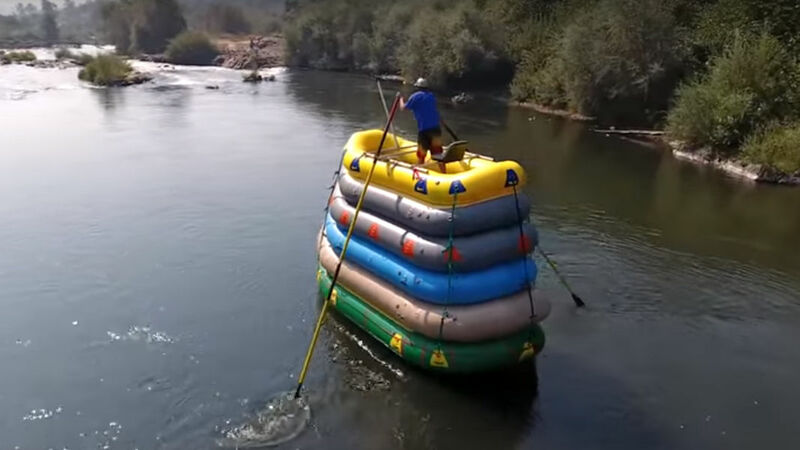 Well, you could always stack six rafts on top of each other and hit the rapids. Professional rafter Covey Baack did just that, using custom nine foot oar extensions. He navigated some class four rapids on top of this crazy creation. It looks like it could tip at any time. I would say it is his skills more than the structure itself that kept him alive and not in the water at all. I have to admit, it does look like a a lot of fun, even if it is something that none of us should try ourselves. Now I wonder how long it will be until we see others trying to go higher and making a contest out of it. If it all goes bad, you have to assume one of those rafts will save you somehow.